Introducing the future of sending CW, HobbyPCB's innovative IQ Keyer, brings CW into the digital age. 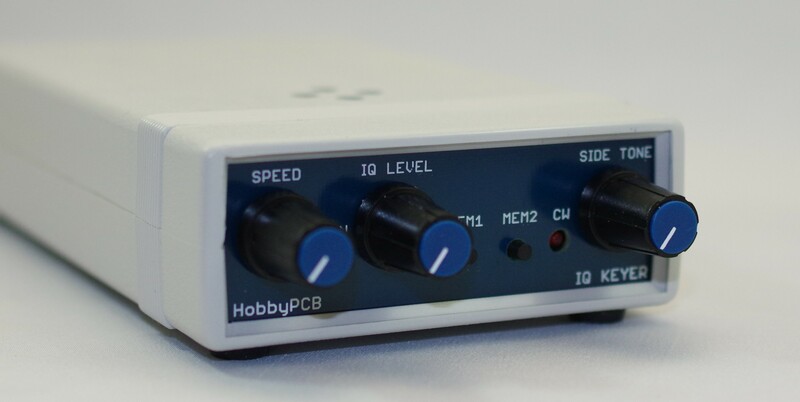 The HobbyPCB IQ Keyer is a full function Iambic, memory CW Keyer. The most unique feature of the IQ Keyer is low-dostortion, adjustable level, I and Q audio output that can directly modulate IQ baseband transceivers like the RS-HFIQ and the Softrock with low-latency CW, allowing these transceivers to operate CW smoothly and efficiently. The IQ Keyer has a USB interface that allows entry of memory messages, text to CW and advanced contesting modes. The IQ keyer has built-in sidetone and conventional PTT output for use with all Ham Radio transceivers. Processing for the IQ Keyer is supplied by a built-in Arduino Nano so the software is completely open-source and can be updated/modified with no-cost tools. The IQ Keyer is and Easy-Build kit with all of the SMT and many through-hole components installed using professional assembly techniques. The builder only needs to complete final assembly, upload the Arduino Sketch and the IQ Keyer is ready to go. This is an excellent project for the first-time kit builder with excellent documentation and legendary support, HobbyPCB guarantees that your keyer build will be successful. More information, usage and assembly instructions can be found at http://www.iqkeyer.com.